Next time you see a cop on Bangalore’s road playing around with a Blackberry in his hand, you better be careful.He might just be checking your history of traffic violations and might hold you down for not clearing you earlier violations. The Blackberries consists of a robust database of traffic offenders, real-time access to history of offences, enhanced punishment for habitual offenders, logs types of vehicles being penalized and category of offences and makes the information instantly available to traffic personnel. Well, it is about time that governance goes through a little technology transformation. We could do with aÂ better and robust enforcement system in place, and it is only apt that the IT Hub of India has taken the initiative. Will It Help Keep Corruption in Check? The objective seems to suggest so. Evidently, the devices are completely tamper proof, so even the cops will not be able to manipulate any changes in fine etc. Moreover, a Violation Evidence Management System has also been implemented which includes 160 surveillance cameras.So, the offenders will have nowhere to hide even if they are able to shrug off the cop on the road. The real time information powered Blackberries are expected to empower the traffic cops to nail down the traffic violators and provide them with enough data to enforce harsh punishments on the habitual offenders.So, the Bangalore juntaa better revise the traffic rules. All that’s good but then can all these help keep the corruption on the roads in control. The systems talk about doing away with the Carbon paper notices and make fine manipulations a thing of past.But, how many of the cops issue a ticket in the first place. I wish i had the data to supplement this but from what I have seen, a majority of the fines slapped on the traffic violators are paperless. Yes, for the lack of a better word, ‘Juggad’ system does it most of the time. So, I wonder how much help these Blackberries be for enforcing traffic rules. However, betting on the human psychology , I wonder if the access to past records of offenders with the traffic cops is going to deter violators a wee bit. But, all said and done it is indeed heartening to see that India is making progress towards E-Governance.Only time will tell, if the 40 crore budget to improve traffic enforcement proves successful, but the intent seems right. What are your thoughts on the traffic police going tech savvy. Will it help enforce traffic regulations? Â Moreover, will the cops be willing to adopt it whole heartedly when the system is designed to put the brakes on under-the-table transactions that happen. Surprise…Surprise ! Yahoo more popular than Google in Social Media ! I dont think it serves much purpose. Only advantage is that the cop can access the history of the offender (if at all he wishes not to play JUGAAD). 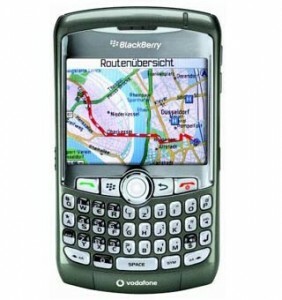 Secondly the Blackberry phone is supported by a Bluetooth printer to print the tickets. I cant say how often they have to load new papers in the same though !!! ALso the training part.. I have seen cops using the latest blackberry phones with the cap (reverse of a Reynolds 045) pen and not their hands… i really doubt with this state of affairs would it really serve the purpose ! !